The Vineyard Post has a main rule on the vineyard stability. Wire Spreaders, Fixed Brackets, Wire supports, Wire Tensioners Collar, Hook for Tightener and many more! In case of mechanical harvesting the stress due to the mechanical process are too high for a Weak Vineyard Post. All 6 families of Vineyard Post have their own benefits but, according to the type of System we will set, we must choose those more suitable for us. Every section explains the benefits of the different types of Vineyard Posts perfect for our Future Frame. 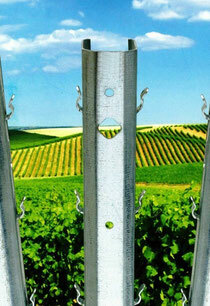 The metal post is considered as the new support in the modern winegrowing. They are replacing the most common wooden and concrete poles. 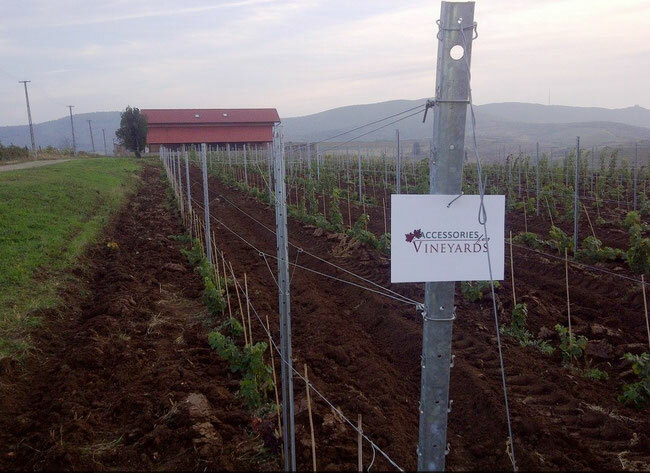 Thanks to its easy handling which allows to be set up everywhere and its heavy zinc covering, the Hot Deep Galvanized Metal Post gives to the Vineyard Layout a sturdy, durable and efficient structure. 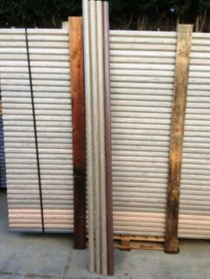 The strip Galvannized Metal posts are produced with pre-galvanized sheet. As their cousins in HDG, they are replacing the other ones thanks to their "Easy Use". They are cost-effective, extremely durable, sturdy, light weight and easy to use - by hand or with machine. This particolar type of post is made by a special steel called Weathering Stell, as well as better known with the name of Corten. The main property is to allow them to exhibit increased resistance to atmospheric corrosion compared to other steel. Good aptitudes are recognized to these Posts. Their short longevity over the years make of the Wooden Post a good support for the present only. 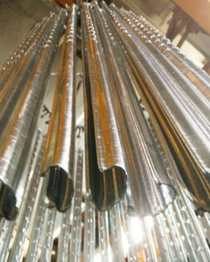 A good alternative is to offer those poles covered with Stainless Steel or Metal Sheet. For many years between all the Vineyard Posts, the Concrete post has been the most sold. The most used in the Vineyards are those Pre-stressed with the following benefits: Durability over the years, good resistance to the mechanical process and good prices. 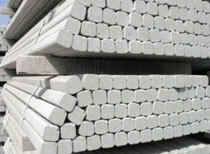 The Pvc Post strength is well-known as the best between all the others categories. The circular section gives to the post mechanical properties which allows to set up every post at 6 meters. 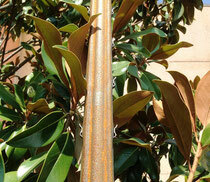 The coated surface made in resin allows a long life to the whole structure of the Pvc Post. Do not hesitate to contact us for any information you may need. Free Estimates!